The one map that I had been able to find that kind of explained a lot in terms of the whole arguement of if it is one system, or multiple systems was actually more or less laid to rest when a 'poster' had been produced for general purchase that showed what you see below. I would like to credit the 'Firefly and Serenity Database' for the explanation you see below. Their link can be found in the links section and I hope that they don't mind grabbing the data as again it is one of the better explanations of the verse I have found so far. The star system is a star cluster, of the likes of the triple star system Alpha Centauri. It consists of five main sequence stars, around which orbit an assortment of protostars, gas giants, asteroid belts, planets, and their moons. Four of the main sequence stars orbit a central star. 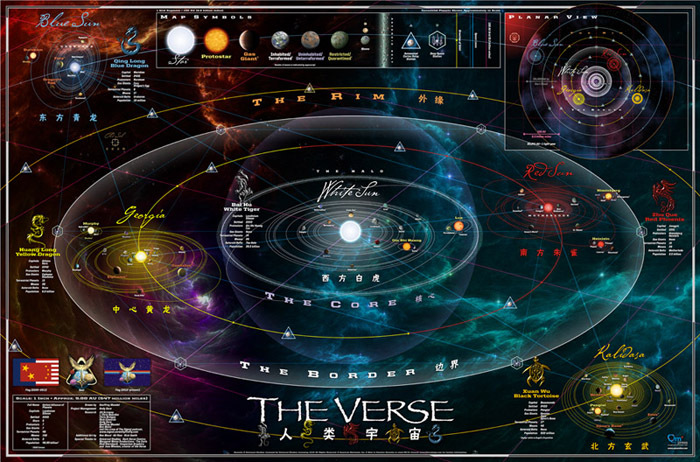 All the worlds what make up the 'Verse have two names, a Sino (Chinese) name and Anglo (English) name. Sometimes, only one is used officially. This is not the case with the five main sequence stars. The Sino names are based off the old-world concept of the Five Elements. 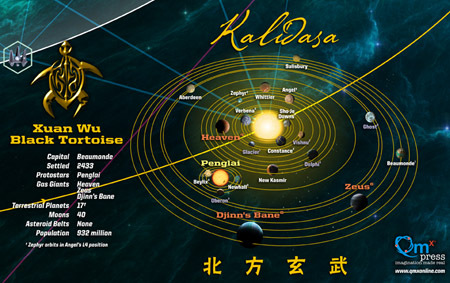 The Anglo names, being possessed of much less imagination, are given by the actual temperature-spectral color of the sun, with the exception of two which are yellow, named Georgia and Kalidasa. 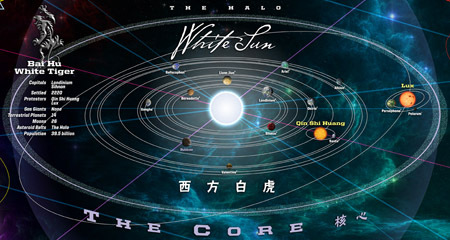 White Sun - also known as Bai Hu - is the center of the 'Verse by all reckoning. 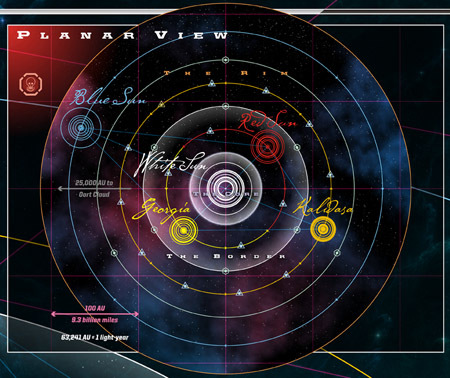 Around it orbit the Central Planets, the home of the Alliance. Planets Include. 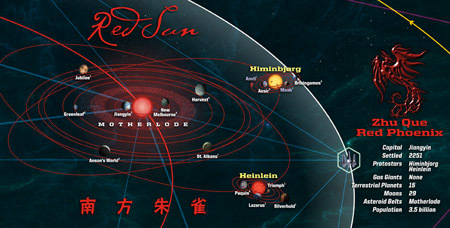 Zhu Que - also known as Red Sun - is the coldest of all the suns in the 'Verse. 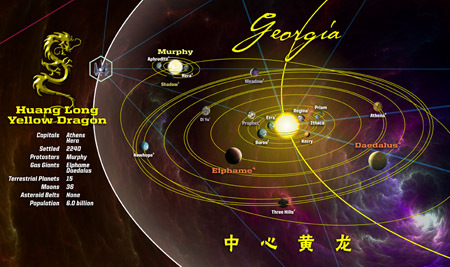 It shares an orbit with Huang Long, sitting in its L3 point in orbit around Bei Hu. Planets include. Angel/Zephyr - An astronomical anomaly, Zephyr naturally occupies Angel's L4 point. 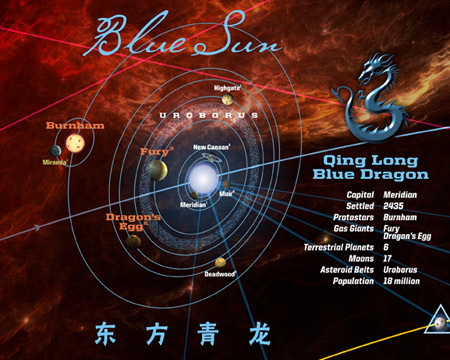 Qing Long - also known as Blue Sun (not to be confused with the Blue Sun Corporation) - sits out on the edge of the 'Verse. It was here we're told the first attacks by Reavers occured. Planets include.